Baseball player Adam Hall extended his hitting streak to 19 games, MILB.com noted, adding that he’s batting .456 during the streak to raise his season average to .304. Their report said, “Adam Hall is squeezing all he can out of the month of August. After going 0-for-4 on Aug. 2, he hasn’t looked back. “The Orioles’ No. 27 prospect extended his hitting streak to 19 games by collecting a career-high four knocks and scored twice as Class A Short Season Aberdeen rolled past Tri-City, 10-1, on Tuesday at Joseph L. Bruno Stadium. He’s batting .456 during the streak to raise his season average to .304. “After lining a single to right in the second, Hall led off the fifth by poking another base hit to center and stole second, igniting a five-run frame. 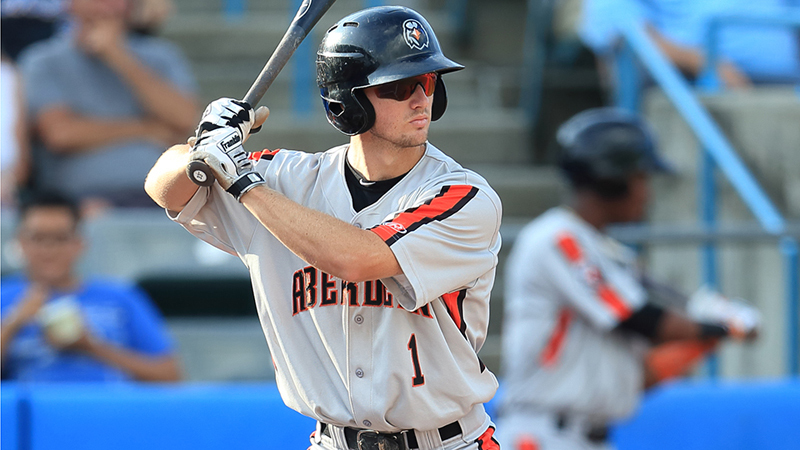 J.C. Escarra followed with his sixth homer to extend the IronBirds’ lead to 4-0. “Hall popped to first in the sixth but legged out an infield single in the eighth to register the first four-hit game of his career. He his 10 multi-hit games during the streak.